Second Wednesday evening of each month. 6:30pm to 9:00pm. Sign-in opens at 5:45pm. Match fee: $12.00 for Rio Salado members, $15.00 for non-members. Pre-registration, recommended but not required, is available on Practiscore starting one week before the match. Click here to go the RSDP Practiscore club page. You must have completed the PSSC, or be classified Marksman or above in IDPA, or D or above in USPSA/ICORE/TNS. This Rio Salado Defensive Pistol match is an IDPA match. IDPA matches offer a place to compete with equipment suitable for defensive use, with limits on round count and course designs that ensure a straightforward test of shooting skills. Simple but not easy, IDPA matches are a great place to get started in action pistol competition. There is a division for most every pistol and all you’ll need in the addition to your pistol is a strong side OWB belt holster plus a few* loading devices (magazines or speed loaders or moon clips) and ammunition carriers (mag pouches or speed loader/moon clip holders) plus a cover garment. 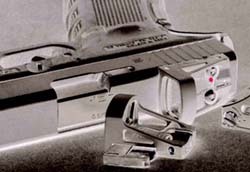 The IDPA website has more information, including a downloadable rule book here. If this will be your first practical pistol match (or you never bothered to get classified in IDPA, USPSA, ICORE, or TNS) be sure that you have completed the Rio Salado Practical Shooting Starter Course before you sign up for the match. Information on the PSSC is here. Please note: We do not allow IWB holsters for new (Unclassified or Novice) shooters at this time because with the early sunset it is effectively a low-light match and it is difficult to watch for safety violations. When we have light later in the evening and allow IWB we will change this notification to explicitly allow them. Specifically prohibited under IDPA rules (for all shooters are): Cross-draw carry, Shoulder holsters, Small of the back carry, Appendix carry, and Pocket carry. Full size guns with 8 or 10 rounds in the magazine: Three magazines and two mag holders. Compact guns with 6 or 7 rounds in the magazine: Four magazines and three mag holders. Revolvers (6 shot maximum): Four speed loaders/moon clips and three holders.